The New York Times bestselling author of Privy to the Dead returns to Philadelphia for more history—and a chilling mystery . . . When the Pennsylvania Antiquarian Society discovers it owns some unique real estate, a deadly plot unfolds . . .
Society president Nell Pratt believes life is finally going her way. Everything’s running smoothly at work, and her love life is thriving. Then some unexpected news rocks her foundation. Two members of a local neighborhood rescue program, Tyrone Blakeney and Cherisse Chapman, inform Nell that her society owns an abandoned row house in a rundown area of Philadelphia and they insist on taking her to see the property before its date with the wrecking ball. But soon after they arrive at the house, Cherisse is fatally shot and Tyrone is badly injured. The police believe it’s just random violence in a bad neighborhood, but Nell thinks there’s more to it and is determined to find answers before someone else becomes history . 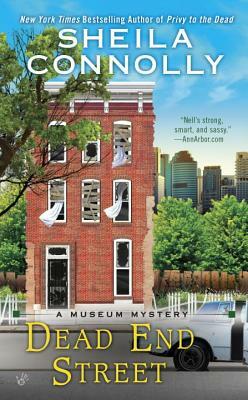 . .
Sheila Connolly is the New York Times bestselling, Anthony and Agatha award–nominated author of the Museum Mysteries, the Orchard Mysteries, and the County Cork Mysteries. She has taught art history, structured and marketed municipal bonds for major cities, worked as a staff member on two statewide political campaigns, and served as a fundraiser for several nonprofit organizations. She also managed her own consulting company, providing genealogical research services. In addition to genealogy, Sheila loves restoring old houses, visiting cemeteries, and traveling. Now a full-time writer, she thinks writing mysteries is a lot more fun than any of her previous occupations.